Madame de Pompadour, born as Jeanne-Antoinette Poisson on december 29, 1721 grew up in the affluent circles of Paris where she is popular and loved. 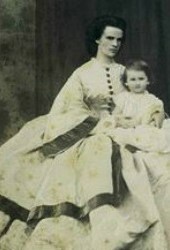 She is married on her 19th to Charles-Guillaume Le Normant d'Étiolles and has a daughter, Alexandrine-Jeanne. Her non-noble birth did not keep her connections, the bankers of Pâris, Cardinal de Tencin and Marshal Richelieu, from bringing her to the attention of King Louis XV, in the hope that she will become the new official misstress. That way they can try and influence him through her. 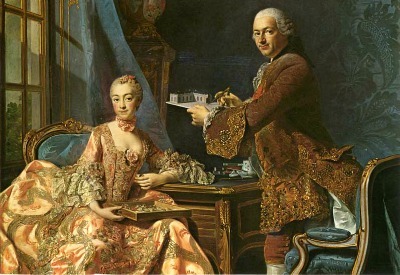 King Louis XV is married to Queen Maria Leszczyńska for 10 years by then. In those 10 years, she has had 10 children, and she has made it crystal clear to the King as fa as she is concerned, that’s enough! She denies him access to her bed (the only form of contraception that there was at that time!). King louis XV with three of the four Nesle Sister he had an affair with. He is talking to Pauline Nesle, her sisters Diana and Louise are watching the couple closely! 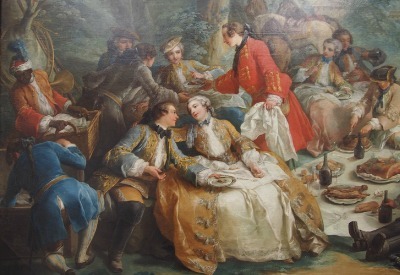 King Louis has no lack of female attention and enough mistresses, including four or the five daughters of Louis de Mailly, Marquis de Nesle, but the function of maitresse en titre is vacant at that time. The plan of the bankers is successful, the King falls for the charms of Jeanne Poisson. Problem, however, is that she is not of noble descent and therefore cannot hold the official function of Maitresse en Titre. Of course for a King in those days this is no problem. He buys the title Marquise De Pompadour, a noble title that was coincidentally vacant at the time. In addition, he gives her the castle of Pompadour, the first of many houses and castles that would follow. 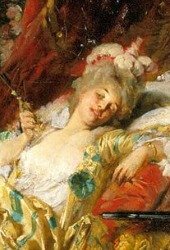 Now there are no more obstacles for Jeanne de Posisson, now going by the name of Madame, or Marquise de Pompadour, to move into the spacious apartments at Versailles that are intended for the Maitresse en Titre. The only obstacle are the courtiers, who clearly ventilate their disapproval; a commoner at Court, they had never experienced that before! The conservative, to Royal protocol addicted courtiers, call her names and some of them oppose to her until her death. Madame de Pompadour ignores these people and becomes indispensable to the King quickly. The King, who formerly especially amused himself with hunting of game and women (hunt), becomes inspired by Jeanne to attend other matters. She starts to ramp up theatre plays, in which she and some friends play the lead roles. The little theatre where these performances take place only has place for 14 people. Later she gets more space and there may be around 40 people able to see the play. Of course the courtiers load actresses too, but everyone at Versailles palace wants to witness the performances, get invited to the suppers and parties and have access to the King. Also her petits suppers are famous. 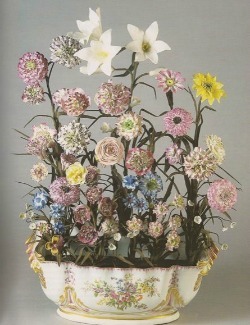 She decorates the tables and rooms with flowers of Sèvres porcelain, and chalices full with olfactory waters from Grasse. She is intelligent and well-read, among her friends and protégés she can count Denis Diderot and Voltaire. The attitude of many courtier turns, they try to reconcile with the Marquise de Pompadour so they will be invited to her performances and diners too. She keeps having enemies at court anyway. The King and his mistress spend hours together planning purchases, remodeling and decorating countless houses and castles. Madame de Pompadour surrounds herself with beautiful stuff, her rooms are jammed. She sends her brother, Abel-François, Marquis de Marigny, who has no political aspirations, to Italy to study art. Together they become great protectors of art and science in France. The Marquise de Pompadour is crazy about porcelain. Under her influence the famous porcelain factory from Vincennes is moved to Sevres in 1756, and given the ' Royal ' status. 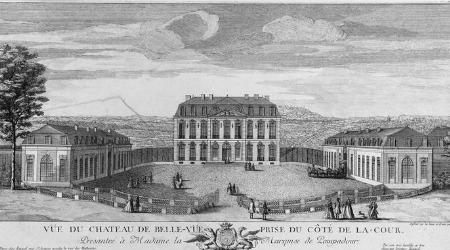 This is not entirely coincidentally since Madame also owns a castle here; the Chateau Bellevue. The first property that Jeanne owns is the castle of Pompadour, South of Limoges. The fun part of this is, she's never been there herself! The Castle was merely a byproduct to the title of Marquese the Pompadour that the king got for her. The Chateau the Pompadour now houses one of the best riding schools in the world, and you can also go horseback riding yourself. The castle is open for visits. The hermitage at Versailles was for Madame the Pompadour what the petit Trianon was for Queen Marie Antoinette some years later; an idyllic, quiet and rural one-story building where she and the King could retire from the busy and demanding court life. Jeanne kept chickens, goats and a donkey. The Pavilion was surrounded with a beautiful garden. The decor was simple but tastefully. The success of the hermitage is demonstrated by the fact that soon two more of such houses were built, one in Compiegne (unfortunately totally destroyed nowadays) and another opposite to the chateau de Fountaineblue. This last one is still intact and in 2011 it was for sale for USD 9.3 million. If you have some money to spend; the Hermitage opposite of the Chateau de Fountaineblue is for sale! The King used to leave Fountaineblue in his hunting clothes like he was going hunting, and then sneaked to the hermitage and spend the whole day with the Marquise! 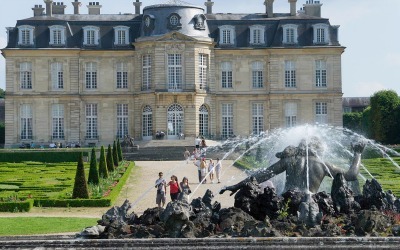 Château de Choisy was a gift from Louis XV to madame the Pompadour in 1746. This castle was nationalised during the French Revolution, and since then demolished bit by bit. There have been three palaces on these grounds, the second one inhabited by, among others, Madame de Pompadour. This second castle was demolished in 1793. A new castle was built on the estate in 1921. 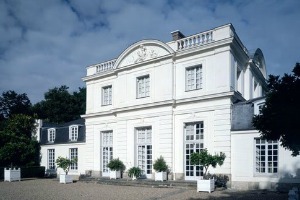 Château de Champs, at Champs-sur-Marne was hired by the Pompadour from the duc de La Vallière. She spent 200,000 livres there in 18 months to redecorate it, but left is than since the King did not like it there. The Élysée Palace, nowadays the official residence of the president of the French Republic, was a Jeanne’s house in Paris. She had her favourite architect, Lassurance, make some adjustments and changed the gardens. You can visit the palace only on European Heritage Day, but you can make a virual tour on the website of the Élysée Palace. The Château de Menars. Madame de Pompadour bought this palace in the Loire Valley at the end of her life, she's been there only twice. After her death, she left it to her brother and he went to live there with his wife Shahin Marie Françoise Filleul (the illegitimate daughter of Louis XV and Irène du Buisson de Longpré!). Nowadays this castle is the only one that is 100 % privatly owned by a philanthropist who painstakingly restored it. It took him three decades and more than $100 million. Upon request the chateau sometimes welcomes visitors. 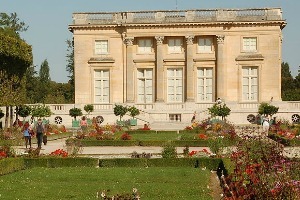 The Petit Trianon was the last building that has been added to the park of Versailles. This was a joint project of the Marquise de Pompadour and the King. The construction lasted from 1762-1768, and unfortunately Madame de Pompadour already died before it was ready, so she did never use this small Palace in Greek style herself. Queen Marie-Antoinette would later use it often to escape the crowds at Chateau de Versailles. 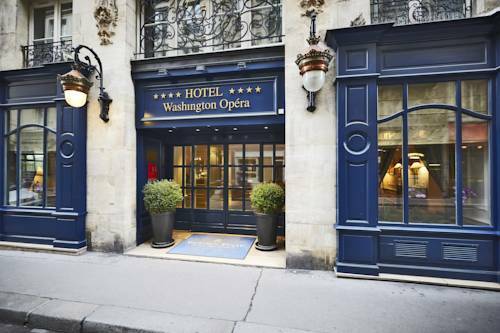 Hotel Washington Opera was once the town house of Madame de Pompadour. Nowadays, the building is a romantic 4-star hotel in the heart of Paris. Click here if you want to spend the night in the former house of Madame the Pompadour! 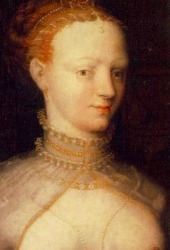 Jeanne Poission remained the King's first mistress until her death in 1765. 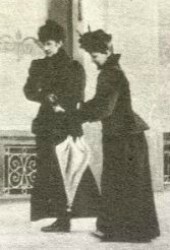 She died of tuberculosis after nearly 20 years at court, she was only 43 years old. Common believe is that during the last years of her life she probably had no more sexual relations with the King. Still, she was his most loyal friend and counselor; that must have been be true love! The French population did not love her that much at the end of her life, they held her responsible for the seven years ' war that made France virtually bankrupt. After her death, she was buried in the Church at the place du Vendôme where her daughter Alexandrine was buried before here ( she died in 1754 at the age of 9) .This church, like most of her homes, is gone nowadays. Most of the extensive legacy of Madame de Pompadour went to her brother, Abel, Marquis de Marigny. He decided to sell most of the items. This sale began in april 1766 and would last one year. Interested people could see the collection in Paris, and there were many interested people. Everyone was interested to gaze at the excessive wealth of the Maitrese-en-Titre, even though most visitors could not afford to buy anything. Thus began the spread of the Marquise’s the collection of artifacts, books, furniture, ceramics, etc. Abel kept a lot of the paintings that portrayed his sister though. 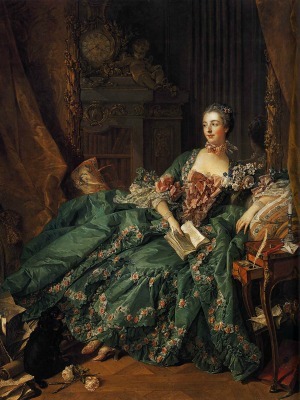 He himself found the painting by van Loo, which shows madame de Pompadour dresses as Turkish harem women, showing the best resemblance with the real Jeane. 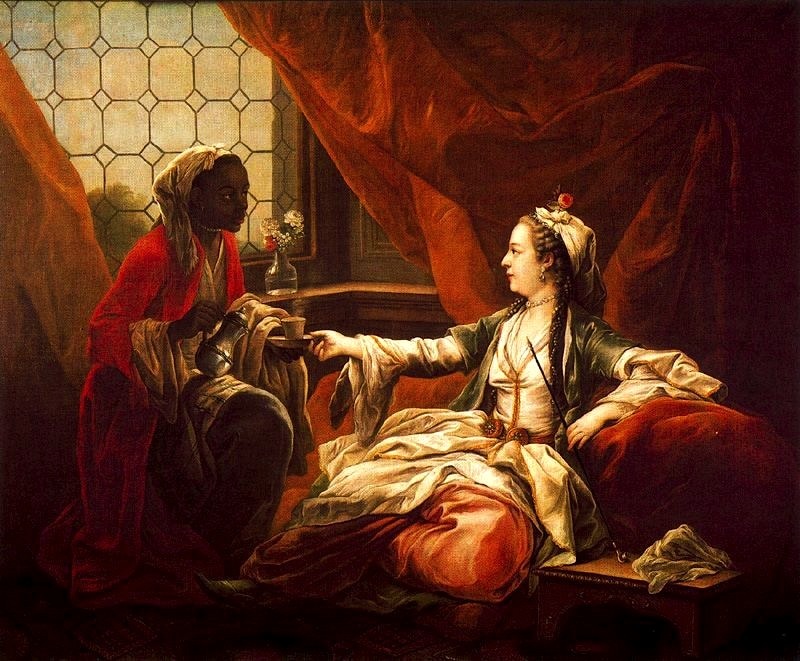 Madame de Pompadour as Sultana Taking Coffee by van Loo. In order to find traces of Madame de pompadour a visit to the Louvre Museum in Paris is a good start. Here are the paintings of Boucher, de la Tour and Nattier. Also, some furniture with her coat of arms can be found here among other works of art. The Petit Trianon was originally designed for Madame de Pompadour, but because she died before it was finished nowadays it is mainly associated with Marie Antoinette. There are no traces of her there, and you won’t find any in the state Apartments of the Palace of Versailles either. You will have to take a guided tour and visit the Petit Apartments to find a trace of her. Only this special guided tour leads you into the private rooms of the royal family and the "The King's mistresses' apartments". Unfortunately many of the houses of the pompadour don’t exist anymore. The exception is the Chateau de Champs in Seine-et-Marne. This castle is still there and can be visited. For more information visit the website. Also the Château de Menars still stands on the banks of the Loire, but is privaty owned and not open for visitors. Many pieces from the collection of the Pompadour can be found in Great Britain. For example, the Victoria and Albert museum, the National Gallery in Edingburgh and in the Wallace Collection art and items of Madame the Pompadour can be found.